While children of immigrants have a lot at stake in the discussions surrounding U.S. immigration policy, their interests remain largely ignored in the debate. For instance, little consideration is given to the impact of immigration enforcement on the 5.5 million children, the vast majority of whom are native-born U.S. citizens, living with at least one undocumented parent. Similarly overlooked are the significant challenges experienced by public child welfare agencies that encounter children separated from their parents due to immigration enforcement measures. The U.S. child welfare system is based on the notion of ensuring the safety and best interest of the child; however, this principle is often compromised in the face of conflicting federal immigration policies and practices. 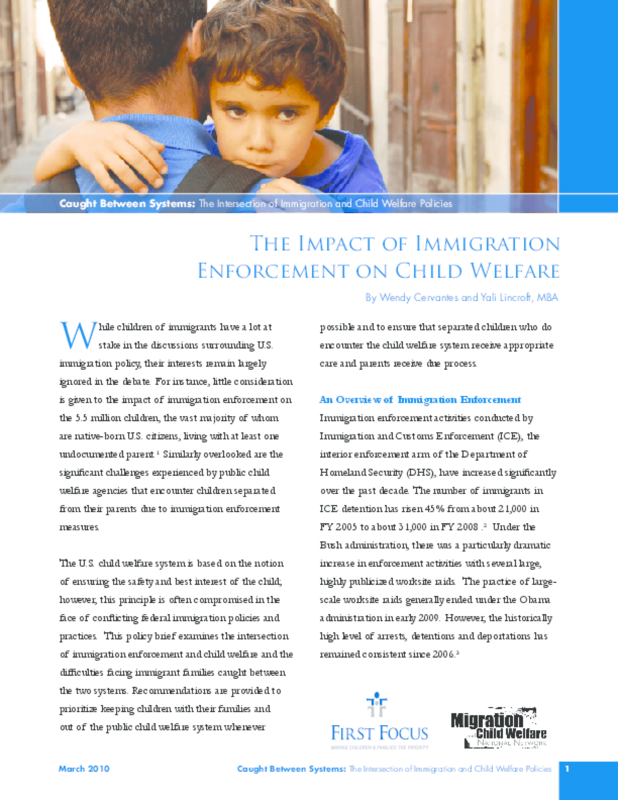 This policy brief examines the intersection of immigration enforcement and child welfare and the difficulties facing immigrant families caught between the two systems. Recommendations are provided to prioritize keeping children with their families and out of the public child welfare system whenever possible and to ensure that separated children who do encounter the child welfare system receive appropriate care and parents receive due process. Copyright 2010 First Focus, Migration and Child Welfare National Network (MCWNN).